This post is the last of four posts about Participatory Sensing (projects and research) that we have been publishing weekly on Fridays in January. In this post I’m introducing the Air Quality Egg project which is currently in process. It is designed for measuring air quality levels and it is being developed collaboratively in an open process by people all around the world. The European Union, through the FP7 EU program, invests large amounts of money on citizen sensing projects generally from a techno-centric perspective. Meanwhile a community of hackers, air quality enthusiasts, architects, activists, entrepreneurs, anthropologists, etc are getting involved holding conversations about the Air Quality Egg project and searching for a more humanistic approach. The Air Quality Egg prototype consists on a Nanode board with air pollutant sensors attached to it. A Nanode board is an Arduino-based board with integrated Ethernet with a built-in application for storing and querying the data at Pachube directly. The idea of developing an air quality egg was born in the Internet of Things meetups in New york, Amsterdam and London, which are being sponsored and promoted by Pachube. It seems that Pachube is interested in promoting citizen’s initiatives that would improve the government’s data with a citizen-distributed open data set stored in Pachube’s site. The Air Quality Egg is a starting platform for future work to come after it. The goal is to achieve data so that the conversation on air quality can be started. We have already seen other air quality measuring and monitoring projects in previous posts and having a look at the Internet we can find more, such as the Copenhagen Wheel Project, SensorMap, OpenSense, or IDEA. So, why is the Air Quality Egg project catching every one’s eyes? People are getting engaged. Open process. There is a very interesting complex mixture in these meetings where we can find activist and entrepreneurial motivations for developing citizen-driven sensor-networks. Entrepreneurs know that people care about health and see this citizen driven sensor networks as a possibility for new business and enterprises. Measuring devices and wireless sensors are being mentioned in journals like the New York Times as they are starting to be widespread technologies and industries. In this electronics weekly magazine we find a post about “Wireless sensors tap ambient energy” that introduce the concept of the actual deployment of this wireless device. People are collaborating globally. The online conversation. Internet allows for global scale conversation and reflection using tools such as wikis or google groups. This conversation is putting in touch people, building a community of developers and air quality enthusiasts. From the beginning conversation turned around the “why, the how and the who” of the project. There was a call for reflection about the situation of the egg within an specific local context to make it important for users in their daily lives. The possibilities of the owner’s relation and interaction with the Egg have also been discussed. Which interaction could the egg have with the owner and the egg’s owner community? Concepts as gamefication or customizing the egg as a living being (“incubating data”) had been debated. Conversation was also revolved around the evaluation of available technologies regarding batteries, sensors, calibration processes and their costs. The thinking and prototyping of systems are happening in parallel: the conversation is on the Internet and workshops are being developed during the meet ups along two different continents. People are collaborating globally. The Meet ups. Face to face collaboration on the project is also taking place at the IoT Meet ups and workshops.The first and the second meetings were in held New York. The third one which I attended to was in Amsterdam. 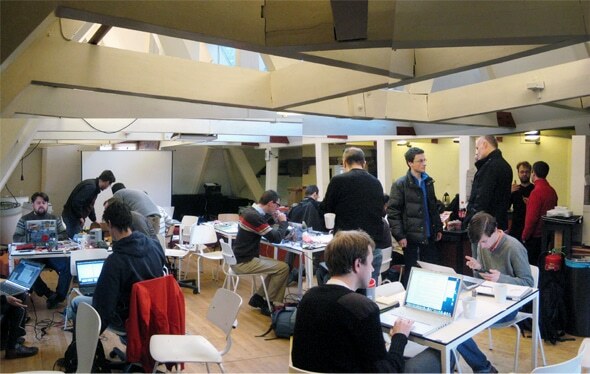 The Amsterdam workshop was one step forward to the air quality prototype, being held at the Waag. 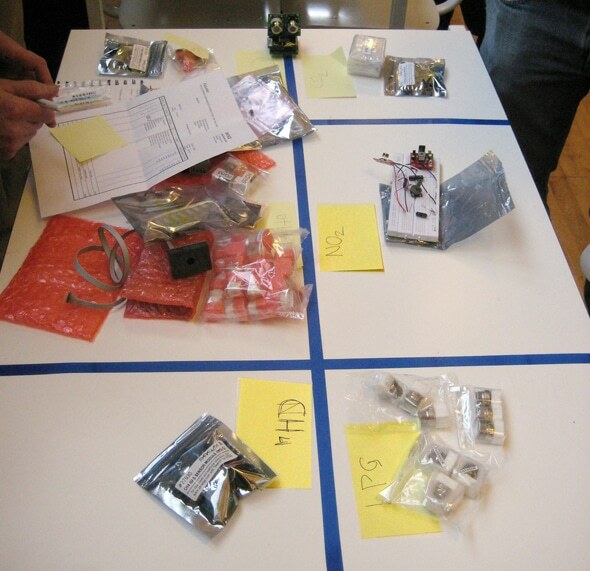 The aim of the workshop was to start building a prototype, trying all types of pollution sensors and facing the problem of calibration for building a global project that might work both in Europe and in the United States. More information about the development of the workshop can be found at one of the attendant’s blog. To follow and be aware about the current process of development of the Air Quality Egg project you can find more information in Pachue’s blog. 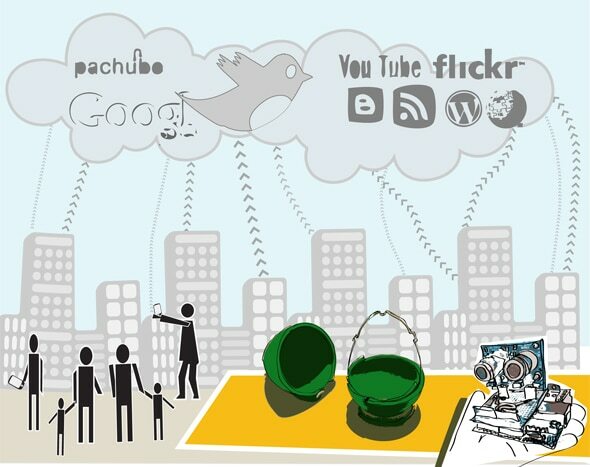 Some Internet of Things projects had been successfully funded by crowd-unding platforms. Among these projects we can find “Ballon Mapping Kits”. It is an Open Hardware kit in a balloon that has been helping residents of the Gulf Coast to map the deep water oil spill. Some of the common traits of these successfully crowdfunding projects are the empowerment of users and the fact it is a simple interface where people don’t have to be a tech-person to understand it. These initiatives are framed as promoting the public interest and are complemented with a well managed communication campaign. Open process projects to prototype an object can be funded by their future users and owners promoting the participation and engagement of people. I have my hopes pinned on this kind of funding that could allow interesting bottom-up projects to be successful. The green egg from the main picture is inspired on the egg’s design by Albert Chao. 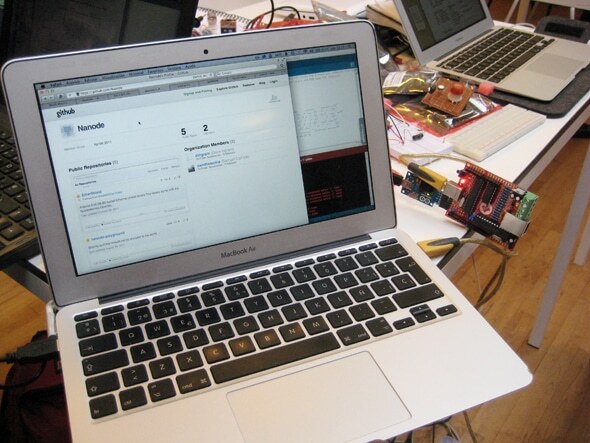 All images were taken at the IOT Meet up in Amsterdam on the 17th December 2011. Finally I am grateful to JP de Vooght, César García, Sara Perez Thomsom, Dorien Zandbergen, Martina Minnucci and Javier Esquillor for the feedback and conversations on citizen and participatory sensing. Sara Alvarellos is a young architect interested in citizen engagement and implications of technology for architecture and urbanism, actually collaborating with sienteTecity and Oblomobka. Currently researching about Contemporary production, commons and The Internet of Things into Masterdiwo_Alicante framework. Haz tu propia ciudad | Código abierto on Dinámicas DIWO (II): ¿cómo aprendemos?